Project examples | Nachbarschaftsmuseum e. V.
This entry was posted in All, Project examples, International cooperations, Migration and Museum, Youth projects on 21. November 2011 by rita. The Doner Kebab “sandwich” was actually invented in Berlin, by a former “guest worker” from Turkey. In Germany this particular fast food has gone from strength to strength ever since, but it has already started conquering the rest of Europe as well. Berlin alone features ca. 1,600 doner kebab sellers who have long since ceased making their own spits, now mostly procured from professional manufacturers instead. Over the last 20 years the capital has witnessed the flourishing of a veritable doner kebab industry, including supply contractors – to be found in the Turkish Yellow Pages for Berlin-Brandenburg, as are the kebab shop furnishers. commonly refer to the services rendered by these self-employed as the “ethnic economy”.The term does no longer denote a mere ethnic niche, as the typical small shops and restaurants have meanwhile been joined by a steadily growing number of medium-sized businesses in the service and export industries, the media and the arts. Given their important contribution to the city’s economic well-being and cultural life they have become indispensable for Berlin as a whole. European Cities” involving museums and cultural institutions from seven countries (www.eciec.eu). This entry was posted in All, Project examples, International cooperations, Youth projects on 28. September 1999 by rita. 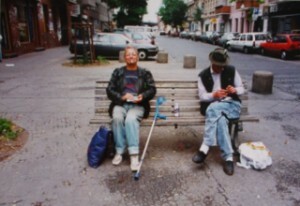 During the project Marking city spaces: If I was King of Kreuzberg (1999) held in the problematic quarter Wrangel-Kiez the elderly together with the younger generation develop ideas for using city spaces. 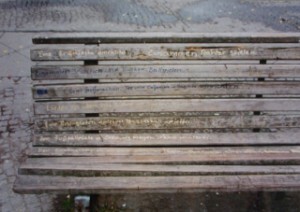 Everybody should say, what he or she would do if they were king or queen of Kreuzberg. Example: A place of joy, where all nations can be happy together, sing and dance. Here they would engrave into a bench their suggestions for joint activities in a senior citizens facility which includes a garden. 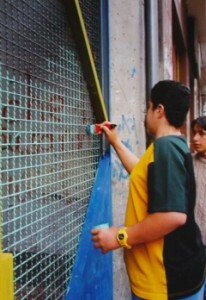 This entry was posted in All, Project examples, International cooperations, Migration and Museum, Youth projects on 26. June 1997 by rita. 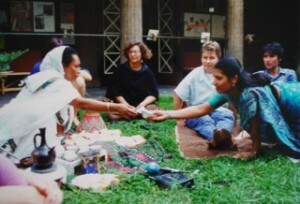 As a part of the project A House in Europe neighbors of different cultural backgrounds meet for Berlin Dining Circles. 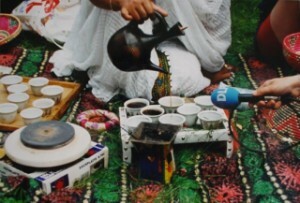 An Ethiopian coffee ceremony held in the back yard of the Heimatmuseum Neukolln in 1995 inspires exchange on coffee rituals.